The incurable Ms. Fever Blister! Traveling Performer & Producer at SNAPPED! Stiletto Productions in Cleveland, Ohio and A Pinch of Glitter of Productions in Los Angeles, Ca, the former city she called home for the past 8 year. Upon her return to her hometown of Cleveland, Snapped Stiletto Productions was born. Ms. Fever is also a fierce and fiery Emcee, Model, Songstress, Actress, Instructor in the Fine Art of Striptease & does basic Pin-up Modeling instruction. Ms Fever performs year round anywhere her bookings take will her. 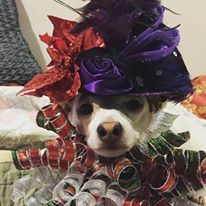 Especially, if her bestest fur baby can tag along, the famous 'FURST' dog of Burlesque Miss Squeezy Von Teasy aka Chacha! In June of 2011, I completed my 3rd and largest tour covering the Midwestern States. Also in 2011, I was a featured performer on the main stage at Tucson Pride, in Tucson Az, performing with Sophie B. Hawkins. In 2012, I produced a Saturday Night Teasers Show for a large corporate event for an I.T Convention that was in Anaheim, Ca. Teases For Toys 1&2 (A local Toy Drive that benefits Children in El Segundo) 2012, 2013. looking forward to Dec 2014!